It's not easy to get your bearings in this one because so many of these structures are gone. Start at the very far right where you can see the Mt. Hood Hotel annex, at First and Oak. In the middle you may recognize a couple of the houses along State Street. The Distillery is long gone, as is the AGA Warehouse next to it. 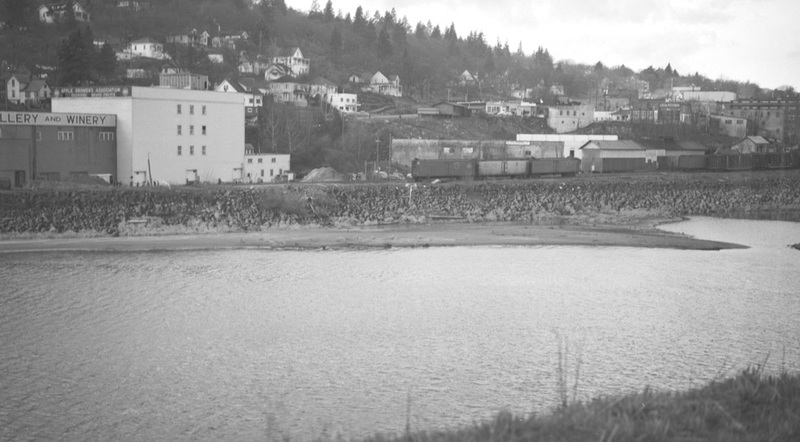 They were north of State Street between Front Street and the bridge over the Hood River. You can see what we now call "The Ruins" at Springhouse cellars-- the remains of an older cannery that didn't last very long. I thought perhaps Alva Day was taking a 1948 photo of the rising flood waters, but the flood was in May/June and there are no leaves on the trees. Any idea where he is standing? This is how I basically remember it when I was a child. I think I see a portion of the Shell station there where State turns down into Oak. Is Alva standing on the main railroad grade and we are looking at the Mt Hood railroad? My first remembrance of Hood River is the long row of concrete and masonry building facing the interstate, in my mind it seemed like the row was a mile long. Yes, this is probably taken from near the west end of the UP railroad bridge. I say he was standing on the road between the "wagon bridge" and the railroad. This road was the main road to the property north of the railroad.